Immunity idols were revealed - and concealed - during Thursday night's episode of "Survivor: Heroes vs. Villains." The Heroes and Villains tribes first squared off in a reward challenge that asked the tribes to rank their members from strongest to weakest. The challenge was to test the tribe members' endurance while they each stand on small footholds, and the competitors would be matched with the person they were ranked equally to from the other tribe. The Villains recognized immediately that the women, who have smaller feet, were better suited to the challenge. All the women would participate, while Russell would sit the challenge out. On the Heroes side, Rupert had a hard time grasping that he shouldn't be listed as the strongest person on the team - even though J.T. tried to explain that the bigger you are, the harder this sort of challenge would be. Finally, he got through to him, and Rupert placed himself at the bottom of their list. The first tribe to have three members drop from the footholds would lose. Three Heroes went down and the Villains won a feast from Outback Steakhouse. During their time out Parvati found a clue to a immunity idol in her napkin, which she promptly hid. After the meal she showed Danielle the clue and the two later find the idol, but decide to keep it from Russell. "We'll fill Russell in on a need-to-know basis, and right now Russell doesn't need to know, so he's not gonna know," she said. Another immunity idol played a major role this week when J.T. decided to give his immunity idol to Russell, which he hopes will benefit his teammates after the tribes merge. If he gives the idol to Russell, he reasons, Russell will vote out Parvati. The Heroes and Villains went up against each other again in an immunity challenge where the tribes had to move a bag of puzzle pieces along a rope and through a series of obstacles on a platform floating in the water. 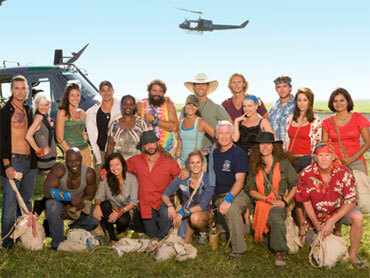 Once all five bags have been collected, the players must use those puzzle pieces to build a totem pole, and the first team to assemble the totem pole would win immunity. The Heroes assembled their totem pole first and sent the Villains to tribal council. As the Villains congratulated the Heroes on their win, J.T. secretly passed Russell the immunity idol with a note that instructed him to vote for Parvati, and that when the teams merged he would be safe with them. While J.T. was convinced the gesture would cement Russell's commitment to his team, Russell was in the Villains camp laughing with Parvati over J.T. 's letter. "'How do you give the Idol King an idol? 'Here Mr. Russell! Here's an idol. This one is just for you,'" Russell chuckles. "What is wrong with him? I cannot believe that kid won," says Parvati. At tribal council, Sandra and Courtney realize that one of them will be going home. Danielle and Sandra argue over Danielle's claim that Sandra puts false rumors into people's minds in order to control the game, and Courtney lashed out at Jerri for flipping to Russell's alliance to save herself. Jerri dismissed her comments, saying that she was never a part of any alliance. The Villains then cast their votes, and Courtney was ousted with five out of the six votes cast against her. The elimination made her tenth person voted out and second member of the jury.